If you're taking on the task of bottle-feeding a kid goat, you'll have your work cut out for you for a while. However, it's not nearly as much of a commitment as bottle-feeding a human kid. A human baby might need bottle-feeding for a year or more, but the caprine variety needs about three months of nursing care. 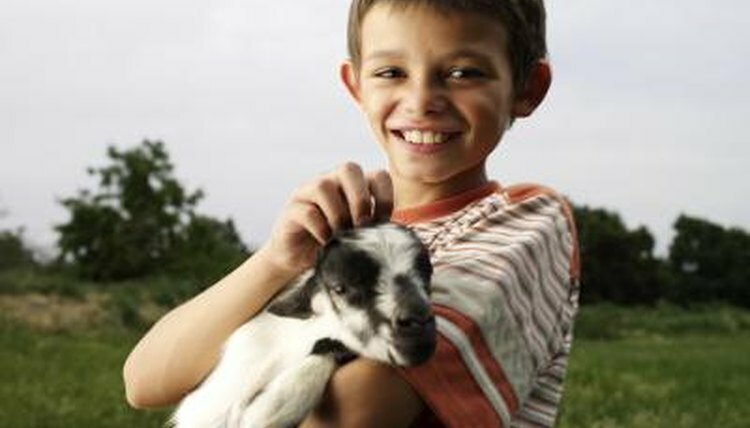 If you're running a goat dairy, you must breed females -- called does -- to produce kids to produce milk. The flip side is that those kids often can't nurse very much on their mothers, as the milk is your dairy's product. You can bottle- or pan-feed the babies. Because the nursing reflex is instinctual, bottle feeding is easier on the kid than pan-feeding, plus you get a better idea of just how much the baby consumes. For the first three weeks, your kid needs bottle feeding at least four times a day. From the third week on, feed him three times daily, cutting back as he transitions to solid foods. If you're hand-raising a baby goat, make sure he gets colostrum as soon as possible. This nutrient-rich first milk provides protective antibodies and kick-starts the digestive system. Although his own mom's milk is the best source, if that doe tests positive for diseases such as caprine arthritic encephalitis you'll need to have safe colostrum on hand. Ask your vet about local sources for frozen colostrum or for commercial colostrum replacers. You also can use bovine colostrum for goats. After a few days, transition the kid from colostrum to commercial goat milk replacer. Even while you're still bottle-feeding, introduce your kid to solid foods by the time he's 3 weeks old. Extension.org notes that feeding goat youngsters solid foods stimulates development of the rumen, the first section of their four-part stomach. Food is partially digested in the rumen, with solids regurgitated to form the cud. When goats chew their cud, they are breaking down these partially digested nutrients. Extension.org recommends giving kids free-choice feed that's 14 to 16 percent protein. The stomach must fully function before weaning. The University of California, Davis Goat Facility weans its kids completely by the age of 3 months. Much depends on the individual; some kids are ready to eat completely on their own before that, but others need longer. However, some kids don't eat enough solid food right after weaning, so monitor the kid's food intake and his weight and overall condition.